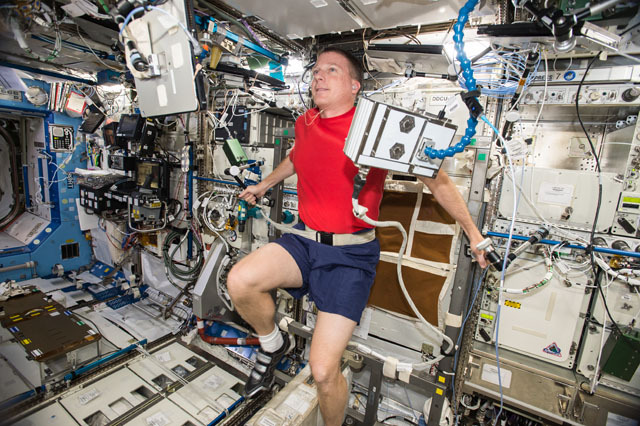 iss042e016770 (Nov. 27, 2014) — Flight Engineer and NASA astronaut Terry Virts works out on an exercise bicycle in the Destiny laboratory. The six-member Expedition 42 crew aboard its orbital home and laboratory is conducting international science and advanced maintenance. Back on the ground, NASA is preparing for the launch of its new Orion spacecraft from Kennedy Space Center (KSC) on its first test flight, the Exploration Flight Test-1 (EFT-1) mission. The International Space Station is providing valuable experience and research that will help further future exploration missions on Orion. The week-long servicing of the Carbon Dioxide Removal Assembly continued Wednesday as astronauts Barry Wilmore and Terry Virts replaced filters and checked for leaks. The device removes humidity and carbon dioxide from the station’s environment. Italian astronaut Samantha Cristoforetti was in Europe’s Columbus lab module cleaning the BioLab. The facility allows the observation of micro-organisms, plants and invertebrates and their adaptation to microgravity. The cosmonauts in the station’s Russian segment gathered in Japan’s Kibo lab module to record a televised event in between their regularly scheduled duties. At KSC, Orion will launch atop a Delta IV Heavy rocket Thursday at 7:05 a.m. EST for a two-orbit test mission taking it 3,600 miles above Earth’s surface. EFT-1 will last less than 4-1/2 hours and will end when Orion splashes down in the Pacific Ocean for recovery by NASA personnel.